We are delighted to invite you to attend the "World Dermatology and Cosmetology Congress", which is to be held during April 29-30, 2019 at Frankfurt, Germany. World Dermatology 2019 brings together Dermatologists, Cosmetologists, Business delegates, Scientists, Directors, Entrepreneurs, Surgeons from around the world. 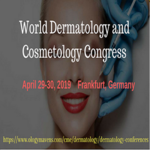 World Dermatology and Cosmetology Congress is designed to bring forth the most up to date information with a complete approach to diverse areas of interest. The topics of the congress will reflect the current advances, current trends, future trends and novel approaches in Dermatology and Cosmetology. Please join us with your peers from around the world for this wonderful opportunity to reach the largest assembly of participants from the Dermatology and Cosmetology community, meet with thought leadership experts, share your new research, and show off your cutting-edge expertise at this event.